Randy, Jeff, and Brad are destined to investigate the trails, peaks, logs, rocks, streams, lakes, sky, birds, moose, etc. of the Colorado wilderness. 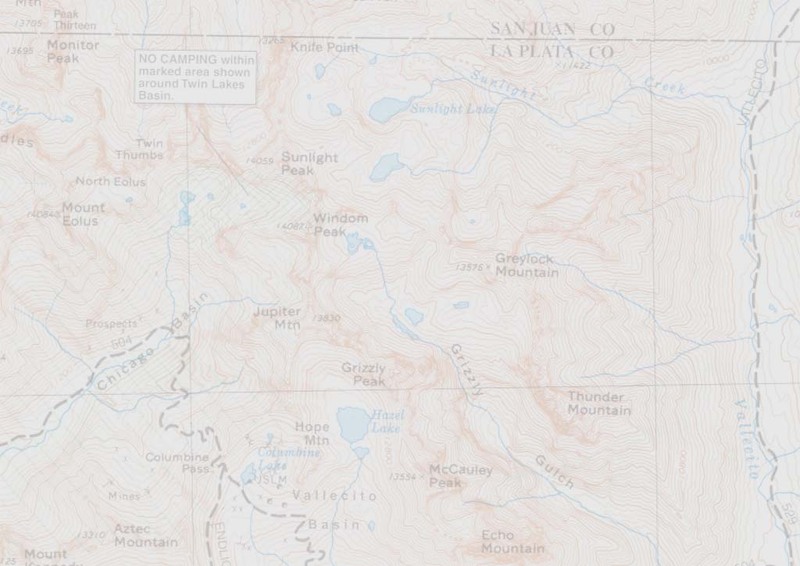 The plan as we understand it so far (today's Sept. 8th, and I think we'll be camping the night of the 16th so we'll be deciding soon) is to head for the Weminuche Wilderness Area, which spans parts of the San Juan, Uncompaghre, and Rio Grande National Forests of SW Colorado. One possible entrance is the Vallecito Creek trail, above Vallecito Reservoir north of Bayfield, CO. 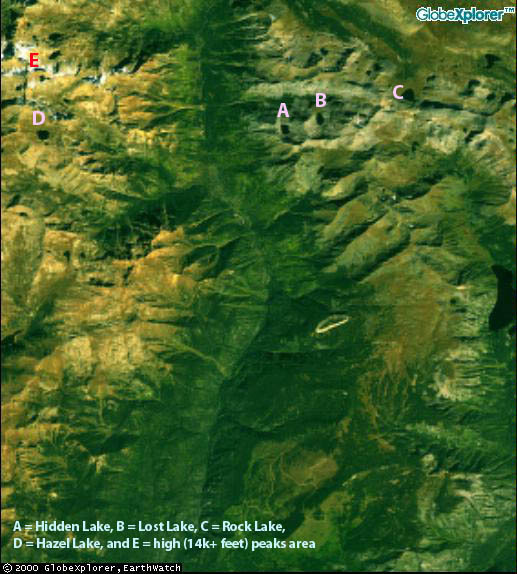 This aerial shot shows the Vallecito Creek drainage (lush green from south to north), with Emerald Lake partly visible on the eastern edge and the high peaks (14'ers Eolus, Sunlight, and Windom Peaks) in the upper left... Driving to Pagosa Springs in February took about four and a half hours via scenic Hwy. 285; Bayfield is a little past there, so we'll have to plan on roughly six hours on the road to reach the trailhead. We'll be venturing into the wild in about the third week of September, and the weather is, as they say, quite variable. Snow can fall any month of the year up there, especially at the higher elevations. On the other hand, it could be fairly warm (we hope). We'll be keeping a close watch on the weather, and may opt for either a lower-elevation route or shorter trips if things get ugly (cold and wet). Whichever way the weather goes, I recommend we take a measured attitude into this trip. Not all of us will be acclimated to the high elevation, so if we take our time rather than setting impossible goals, we'll be almost certain to feel well while we enjoy the scenery as well as the company. We don't expect to see any of these mouse deer critters since they live in Asia. List of items each of us ought to bring along. List of items we ought to bring as a group.